Unsurprisingly, Twitter Towers are made up of the books that I heard about through the social networking site. I know, I know. You don’t have to look at me like that… Even with my prodigious level of book-squirreldom, I was a little taken aback at just how many books I managed to accumulate in one year! I follow the author on Twitter because I already read and enjoy their books e.g. Marika Cobbold, Margaret Atwood, A L Kennedy and Joanne Harris. The author’s books are available in German. I know this one is a bit random but I’m always looking for books to read that will help me brush up on my rusty German. Victoria Connelly’s first three novels are, so far, only published in German and these were a great find last year, and I now have a copy of Miranda Dickinson’s first novel in German, which should be a fun read because I already know the story and can refer back to the English if and when I get stuck on vocabulary. Out of these, the second category accounts for the greatest number of books in my Twitter Towers. I suppose that’s not a total surprise. I follow, and am followed by, a lot of writers and it’s only natural that, if I’m chatting with them, reading their blogs and hearing about what they’re writing, I’ll want to read some of their books. Happily, this means that I’ve read authors who I might otherwise never have come across, which would have been a real shame. Twitter put me onto the trail of some terrific books that I thoroughly enjoyed reading last year and whose authors are now firmly on my radar. However, I would also say that if someone doesn’t engage in conversation with me on Twitter, even though we’re following each other, I’m much less inclined to check out their book, especially if all they want to do is broadcast that it’s available. I keep a list of books I read each year anyway but about half-way through 2010, I started keeping tabs on all those books, which I found or decided to read because of Twitter. At the end of the year, I tallied it up and discovered that OVER HALF of the books on the list were Twitter finds. So, while I don’t know if Twitter can sell books in vast numbers or make a huge difference to book sales, I do know that it made a dramatic difference to the books I read last year. From comments made in my Twitter feed, I know I’m not the only person on Twitter whose book choices are being affected by the social networking site. How about you? Did you find a book through Twitter last year that you might not otherwise have read? Is it changing your book buying habits, too? * Missing-in-Action from my Twitter Towers are Della Says OMG! by Keris Stainton and The Grunt and the Grouch, The Little White Owl and Star Friends by Tracey Corderoy, which my nieces received as gifts, together with several reference books on writing and, for obvious reasons, ebooks I’ve read such as The Hating Game by Talli Roland, The Dead Beat by Cody James and Evil UnLtd by Simon Forward. I see meeeee! Times two! That is incredible! I love the idea of Twitter Towers! I never even knew it existed. There’s so much stuff going on there and even tho I spend my share of time on Twitter I don’t know half of what’s happening for authors. Thanks for this info, and hooray for you for supporting authors! Thanks Karen! I have to admit that I hadn’t realised quite how many Twitter books I acquired last year…but I will be using the ‘supporting other authors’ line, should I need a defence!! Wow! It’s fascinating to see all the books in Twitter Towers stacked up like that, and, as you say, that doesn’t include the ebooks you’ve read. I think it says so much about your enthusiasm for books and your generous support of other writers. As a debut novelist I’m really appreciative of the way you got behind Turning the Tide (even though I’m not around very much at the moment as I’m deep in writing mode!). Your approach to books is typified by the fact that you invite your blog readers to enlarge the photo (which I did!) and share your enthusiasm. It’s great to have it to refer back to when I’m looking for something to read. ‘Knowing’ some of the authors whose books I read last year just made reading even more fun for me than it usually is, Chris, and I was more than happy to get behind Turning the Tide. It’s a fantastic debut novel and deserves to be widely read. Well, you’re not so shabby yourself when it comes to great book recommendations or championing great writing through @eightcuts but you’re right, Farmlanebooks is wonderful. I also like @SavidgeReads and @NovelInsights on Twitter for interesting book choices. I’ve downloaded samples of both Steve Gaskin and Moxie Mezcal’s books. (How brilliant a name is Moxie Mezcal?!) And thanks for the tip on Tom McCarthy. Wow, what a lovely selection, I’d love to spend a few days curled up with that lot! One Day by David Nicholls was one of my favourite books of last year, along with The Help by Kathryn Stockett, which is worth adding to Twitter Towers too! It’s the first time I’ve come across a Twitter tower, too! Twiiter is an amazing souce of information isn’t it? And temptation … *glances over shoulder to her own teetering TBR heap. Perhaps the squirrels can treat you to an ereader, less to dust! The problem with Twitter for a person of pedestrian slowness like myself is that I could choose to read books or to tweet but not both. Even reading books takes a long time for I hate skimming, trying instead to savour each and every turn of phrase and wonder what the author means by that. But well done you for doing both. Gladstone, read 20,000 books in his (long) lifetime apparently. And ran the country four times as Prime Minister. But what conclusion one draws from that factlette I don’t know. I am obviously wittering if not twittering so I had better go. 20,000 books?! Wow. I have no idea how many I’ve read to date but I don’t think I’ll ever get anywhere near that figure. I know what you mean about tweeting or reading, Fennie, I did way more of the former which impacted on my reading last year, so I’m trying to get more of a balance this year. I fret and get frustrated if I’m not reading, so it’ll hopefully lead to happier tweets, if I get to read more! Those Twitter Towers look very tidy. I’ve found quite a few books through Twitter too and some great writers that I probably otherwise might not have discovered, like Josa Young and her book One Apple Tasted, for example. Erm, I might have tidied up Twitter Towers before the photo-shoot, as you do. 🙂 I haven’t heard of Josa Young but I am scampering off to check out her book now. Thanks Debs! Same here, Cath. I’ve definitely read books that I might never have otherwise found, thanks to Twitter. I have a huge pile of Twitter books too. Majority of the books I bought in 2010 were products of twitter, for all the reasons you mention. Lots of magazines too, when they have published stories or articles by Twitter-folk. So does Twitter sell books? I should say. Not had one Naysayer yet, Sharon! I did buy some magazines, notably People’s Friend in the run up to Christmas as one of Jan’s stories was serialised in it, but nowhere near as many of those as books. This is such a great blogpost. I love the idea of Twitter Book Towers! The list you’ve made above is really interesting. I found myself buying around sixty books last year and most of them were recommends from other readers and authors on Twitter with links to various blogs and reviews. This excludes the books I’ve received from publishers for review. And sometimes it takes me ages to get to bought / sent books but the love is right there for all of them. I genuinely think that Twitter is the word of mouth hub of the social networking scene. Yes, I put the links on Facebook and we have a lot of followers online, but once something goes onto Twitter, and it gets retweeted a few times, man, there is no stopping that link. And if it convinces even one person to buy that book = perfect news. I wish you the best of luck reading these! You are going to have a fantastic time. Thanks Liz. I think you’re right – Twitter is the social networking equivalent of word-of-mouth and I definitely buy books faster than I could ever hope to read them, even if I did nothing else all day but read! Twitter Towers rocks! I have a Twitter Tower of my own. I think we can safely say that Twitter does indeed sell books. Hi Jennifer! Thanks for popping by. I would love to know the result of your experiment. It’s been so interesting to hear from others how much of an impact Twitter has had on their reading. Brilliant post! I bought The Last Dragon Slayer for my nephew thanks to your review (thank you!). Most of the books on my twitter background I bought and read as a direct result of conversations and links on twitter. When I was choosing books for my first book club at The Walk Cafe I turned to twitter, as I intend to highlight authors with smaller publishers as well as the big hitters (Tom Vowler’s The Method is on the February choices list). 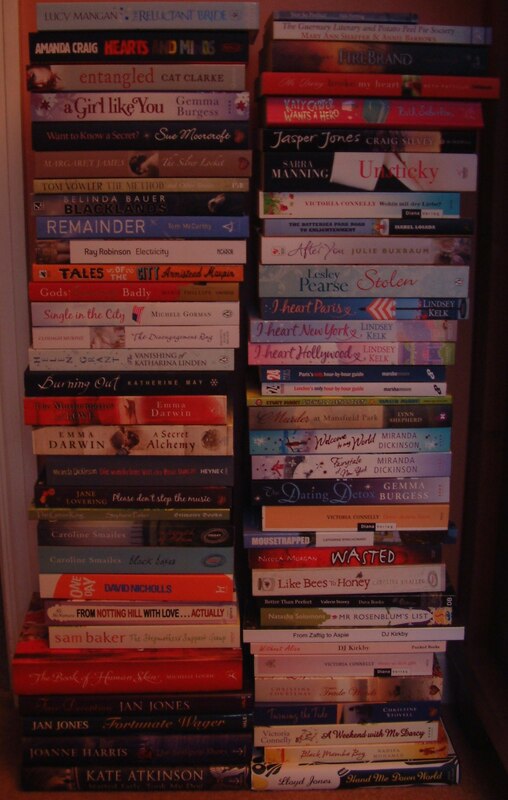 I hope you enjoy reading your way through Twitter Book Towers! All the books – and authors! – you mention are fabulous. I’m reading Tom Vowler’s The Method at the moment and absolutely love his stories. I’ll be very interested to hear what your group makes of them. And I’m thrilled that you bought The Last Dragonslayer based on my review of it – thank you! Oh I love this! I have twitter towers too! They are not as prolific as yours yet, but I also have a twitter-tower wish list which is being nibbled slowly away at! Great post! Love this post, and I totally agree! I purchase books and add books to my TBR list almost exclusively via Twitter recommendations at this point! Maybe it’s simply because I’m on Twitter so much every day, but I think a large part of it is because Twitter is so great for establishing relationships with authors, which in turn makes me more likely to buy their books — and even try books I wouldn’t normally gravitate toward in the store!